The International Centre for Comparative Criminology is directly or indirectly associated with a network and several research chairs, and laboratories. Led by our researchers, these infrastructures have a presence in several universities across Quebec, including the Université de Montréal, Université du Québec à Trois-Rivières, HEC Montréal, and Université Laval. Since 2016, Benoît Dupont has been the chairholder of the Canada Research Chair in Cybersecurity (Tier 1), a chair with a duration of 7 years (2016-2023). The purpose of this chair is to facilitate the emergence of an integrated field of study on cybersecurity by developing transdisciplinary, empirical and theoretical knowledge on the governance and regulation of digital risks. At the crossroads of criminology, computing, and regulation studies, the chair will develop tools to help compare a wide range of cybersecurity practices and policies implemented on a national and international level. Any knowledge acquired will help strengthen the resiliency of the digital ecosystem. From 2006 to 2016, Benoît Dupont was the chairholder of the Canada Research Chair in Security and Technology (2006-2011; 2011-2016) where he concentrated his efforts on better identifying the main changes that affect public and private security. The main objective of this program (2009-2014; 2014-2019) is to better understand the interactions between surveillance practices and discourse about risk, and their structuring effect on the relationships between individuals and institutions. The program is divided into four main areas of research. The goal of this chair (2016-2021) is to develop an innovative research program that quantifies the impact of government provision of public goods on policy-relevant economic outcomes. More specifically, this research will study big data from Italy, Quebec, and the United Kingdom to quantify the impact of government provision of public goods on economic factors associated with long-term economic development. The chair, with financial support from the Canada Foundation for Innovation, the John R. Evans Leaders Fund, and the Quebec government, will create the Public Goods Lab. The goal of the lab is to provide extensive data extraction from unique administrative records and a computationally intensive micro-econometrics analysis of big data. The mandate of the Wolfe Chair (2012-2022) is to conduct research, teach, and perform public outreach regarding the intellectual foundations, nature, and methods of scientific and technological innovation, and to provide support to well-rounded students capable of making constructive contributions to debates surrounding science, technology, and society. The chair is devoted to research that advances understanding of key scientific and technological concepts and examines the relationships among science, technology, and a broad range of social, ethical, political, and economic issues, practices and conditions. Shari Forbes investigates postmortem changes in the body, to determine how Canada’s distinctive environment affects decomposition rates. She and her research team will use her unique forensic expertise to establish a pioneering research site in thanatology in Trois-Rivières, the only place in Canada to offer this outdoor laboratory, and the only global facility representing northern climates. This chair represents an interdisciplinary and interinstitutional collaboration in analytical chemistry, biochemistry, anatomy, engineering and environmental science. Forbes’s research will have an impact on death investigations throughout Canada and around the world, helping in the recovery and identification of missing persons and victims of homicide and mass disasters. The Smart Cybersecurity Network (SERENE-RISC), under scientific director Benoit Dupont, is a knowledge mobilization network created to improve the general public’s awareness of cybersecurity risks and to empower all to reduce those risks through knowledge. SERENE-RISC uses knowledge mobilization, a technique that involves moving knowledge from where it was created to where it can be used, strengthening connections among research, policy, and practice. Knowledge mobilization takes a scientific approach to implementing and harmonizing multiple research disciplines and to sharing that research between research producers (e.g. university researchers) and the end-users, who could benefit from the research results, including government, industry, and not-for-profit representatives. Thanks to a CFI grant awarded to our researcher Benoit Dupont, the ICCC is now equipped with a cybersecurity lab capable of accommodating 10 research assistants, as well as a programmer analyst and a research professional. The lab also boasts specialized software and servers that can be used for both advanced research and data sharing. Under the direction of our researcher Decio Coviello, this lab, along with its cutting-edge technology, allows experts to build advanced economic models that can quantify how the reduction of public goods services impacts the economy. The lab gathers crucial data by analyzing political changes that have occurred in Quebec and Italy during the past fifteen years. Once the model is built, we will be able to anticipate the effects of future public goods policies. Funded by the Canada Foundation for Innovation (CFI) and led by our researcher David Décary-Hétu, the Darknet and Anonymous Research Center (DARC) is a research infrastructure that helps to understand and explain the impact of anonymity technologies on the phenomenon of crime in Canada in general, and more specifically on the activities of illicit online markets. This infrastructure is now required to open new research projects on delinquent activities online. These activities, which recently generated a large amount of traces, are becoming increasingly obscure due to the adoption by criminals of anonymity technologies such as encryption and virtual currencies. DARC has 8 state-of-the-art workstations and a large number of virtualized servers that host the center's massive data collection tools (DATACRYPTO) and bitcoin flow analysis (BITCLUSTER). Affiliated with the Canada Research Chair in Surveillance and the Social Construction of Risk and led by our researcher Stéphane Léman-Langlois, this lab allows around 10 people at a time to immerse themselves in a virtual 3D environment. Located in the Charles De Koninck Building at Université Laval, the lab has two rooms: a main room equipped with the latest computer technology, and an adjoining control and observation room. Intended to offer a review of everything learned during an undergraduate degree, the Crime Scene Lab has both a wet room (meant to simulate a kitchen, bathroom, etc.) and an adjoining dry room (den, bedroom, or living room), which can be either connected to or separated from each other though a common corridor. This lab is a professional photography studio reserved for reproducing photos of items and traces presented for analysis. It has a bottomless table, a light table, two lightboxes, four professional 1100W flashes, each powered by two power packs, four 6500K lights, two Lumahawks (continuous 1200W at 6500K), reflectors, and deflectors. This dark lab with 12 fully equipped workstations (photographic columns, still cameras, monochromatic lamps, excitation and emission filters) allows users to record raw and revealed traces using optical techniques based on selective absorption and luminescence (fingerprints, footwear traces, tool marks, contaminants, etc.). 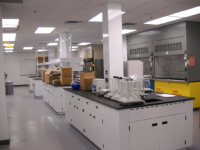 This lab has been designed for the examination of various forms of physical, chemical, and biological traces that students and researchers will encounter. It is safe and equipped with all the supplies an organic chemist requires (lab glassware, balances, ultrasonic cleaners, shakers, fume hoods, ovens, etc. ), including two cyanoacrylate fuming tanks, a vacuum fuming tank (donation from the provincial police force), and a microtome. This lab has been designed to observe and analyze samples (fibres, soil, glass, paint chips) through different levels of magnification, and their comparative identification by polarization microscopy. Data can be recorded on a dedicated system thanks to a set of cameras and focal tubes and professional camera equipment. The lab also has a microtome, 11 stereo microscopes, and 12 optic microscopes. In the concept of a specific training for forensics, lab 3132 is the place where evidence is submitted and students perform their first observations and analyzes to determine the appropriate analytical strategy for the inquiry. It is also where testing is completed by consulting the analytical data for the profile’s requirements and the drafting of various reports.